If you have a central forced-air furnace in the house you are repairing, devote some attention to your duct-work too. 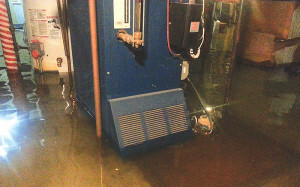 Do not try to salvage duct insulation that has been in contact with flood water. It is impossible to decontaminate. Next, clean, dry and disinfect the duct-work. Doing a thorough job will require disassembling the duct-work. Since many ducts are leaky, un-insulated, and lose a tremendous amount of heat, this is also your opportunity to eliminate wasteful heat loss. The best approach is to carefully seal all joints in the duct-work, and insulate all ducts located in unconditioned spaces such as attics and crawl spaces. Electric forced-air heating systems have essentially the same duct-work as gas-forced air systems, so the same actions are in order. Discard any wet duct insulation. Disassemble, clean, disinfect, and dry the duct-work. Take extra care in reassembling the duct-work to avoid leaks. Carefully insulate all ducts in unconditioned spaces. Even if the system is in contact with flood water for a long period, this sealed system is likely to remain intact. However, if flood water has re-positioned either the indoor or outdoor units of a split system by only a small amount, there is the potential for a breached refrigerant system. The heat pump (or air conditioning system) will then require major repair or full replacement. As with the other types of heating systems, the heat pump system will also have a system of distribution ducts. The same procedures of disassembling, cleaning, disinfecting, and drying are in order. Remember to carefully reassemble the duct-work without leaks, and to insulate those portions of the ducts that go through unconditioned spaces.